Kari Uman designs, develops, and conducts a wide array of workshops. These include Leadership Development, Managing Transitions, Briefing and Presentation Skills, Team building, Facilitating Effective Meetings, Creating and Maintaining a Diverse Workforce, High Achieving Women, Women in Leadership, and Providing Feedback. 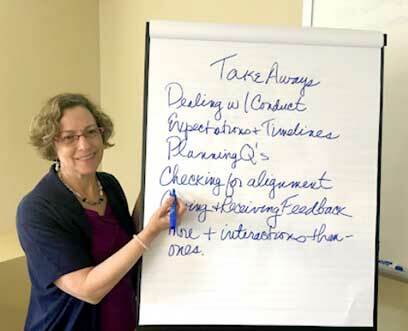 Kari started delivering organizational trainings when she was only 22 while working for the Bureau of Labor Education at the University of Maine. Workshops aim to help workplaces expand their employees’ skills, change behaviors and have new tools and techniques that will help them be more effective and productive in their work. Kari loves to watch the excitement in the participants in her training programs as light bulbs go off in their heads. There is a buzz when real learning is going on, which can be easily applied when back on the job.